As there are a lot of food-related courses present today, this is one of the most basic of them all, although, if we really look into it, it is simple yet challenging. Food processing comes with handling of food, operating common food processing equipment and packaging. You may already apply the ideas you knew about the processing of foods, plus, you may still learn new stuffs regarding this short program. People are not too naïve as to let their work be as simple as fixing their bed. In fact, even when we fix our beds, we put in a little effort so the outcome will not be a so-so. Same is through with our work, and relating to this, there is so much more than just packaging and stuffing foods to their respective places. We may also learn to apply food safety and sanitation before packaging finished or processed food products. The essence of working as an individual and as a team will be developed here as well because there is a shift for individual work and that of teamwork. We are to be taught how to implement good manufacturing practice procedure and maybe perform mathematical procedures too. Lastly, but definitely one of the most important things is the practice of occupational health and safety procedures. There are actually more skills that we may learn from this Food Processing, short course, but if we discuss each, then it wouldn’t be a surprise to those who are interested. Are you interested? Enroll now and find out the other competency skills relating to food processing. Food Processing NC II training time only takes 568 hours to complete. It doesn't take much of your time, it’s lesser compared to when you study in college, but the quality of training is guaranteed and satisfying. Prerequisite - Just a reminder: Some Technical Vocational Institutions (TVIs) are actually requiring their students to train for Food Processing NC I before being allowed to enroll in Food Processing NC II. It’s not actually bad to undergo the Food Processing NC I because by then, you will already know the basics of this short course and will not find any difficulty as you move to the next step which is the intermediate courses. You will already have some backgrounds as to what to do in the basic practical activities in this course. Upon finishing this course, you will be required to take a Competency Assessment before graduation to ensure the issuance of the National Certificate (NC II). 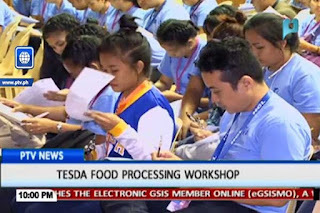 Questions and inquiries will be entertained if you visit directly the nearest TESDA institution in your area.